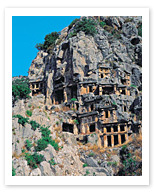 An ancient Lycian city, once a ‘metropolis,’ Myra was abandoned sometime in the 11th century due to an unfortunate combination of earthquakes and Nomadic raids. Left to the ages and the elements, ruins are of course what visitors now come here to see. Myra is best known for its rocky scattering of Lycian tombs, which lie among ruins of an acropolis, theatres, and other vestiges of an ancient and prosperous city. To see some of the really touching sights, like the carvings of deathbed scenes and warriors with their pages, you’ll probably have to clamber up rocks and ladders a bit, as unfortunately the ancient city’s planners evidently didn’t bear in mind that visitors some 1,000 years later would be coming, interested to catch a glimpse, however fleeting, into their everyday lives.